UPND Vice President Dr Canisius Banda has described the new salary increments offered to portions of the public service as fraud. Dr Banda said the civil servants have been hoodwinked into believing that they have been offered hefty salary hikes when in fact not. He said reports that salaries of civil servants have been increased by 5.1% to 28.5% are a complete lie. ‘When you started at 1, and then depreciated to -1, an addition of -0.51 or -0.285 does not amount to an increment. At best, it is appeasement. It is a movement towards the past, where you started from,’ Dr Banda. Dr Banda said the insistence in the use of the word increment amounts to cheating and deception. Dr Banda said civil servants salaries were last increased two years ago but that over the years, the two years period to the present, a lot of economic drama has happened. He said this year alone, the Kwacha has depreciated by 47% saying adding only K208 to K798 to your salary cannot be an increment. Dr Banda said this is a subtle but classical case of government fraud. Dr Banda said what is true is that the government is broke and that its fiscal status is dire and poor. ‘Workers countrywide are now poorer than they were two years ago. And they are feeling it! This is a fact. And being at sea, the government is failing to adequately address this crucial challenge,’ he said. Dr Banda said that what is even worse is that this so called increment will only be effected in January 2016, by which time things would have changed again. ‘By which time the Kwacha might have disappeared; by which time the Kwacha having gotten lost, we might have given up our search for it. Shops and businesses will close, and prices will rise further between now and January 2016. Fertiliser is up from K220 per bag and it is now K450. AMIWA NAKANKARWA NE BA PF. I HAVE FAILED TO UNDERSTAND WHAT THE GOVERNMENT OF THE DAY’S CONCERNS ON ITS CITIZENS. THEY HAVE GIVEN US UNDER PLANNED BUDGETS AND TRULY SPEAKING ZAMBIANS WHERE ARE WE GOING TO FIND MONEY TO PAY THE CIVIL SERVANTS WITH SUCH A DEFICIT IN BUDGET? ITS LIKE ONE PKT OF CEMENT COST K60 AND THEN YOU ARE GIVEN K50 TO GO AND BUY IT, WHERE WILL YOU GET THE K10 TO MEET K60? DEFINITELY YOU WILL BORROW AND HOW MANY BORROWING WILL WE INCUR BY THE END OF PF GOVERNANCE? ARE WE ALL PREPARED TO DIE FOR THE SAKE OF THESE MESSES PF IS CREATING? Another attempt at “donchi kabeba” on civil servants by a dishonest and corrupt PF Government. Do they really think that Zambians are so dull and ignorant that they cannot see this is just another evil trick to hide their mismanagement of the economy? It is overdue for Lungu to face the Nation and admit PF has completely failed. Upnd Ifyamba, U Always Oppose Everything That Comes Yo Way If Govt Gave 100% U Would Be Saying Something Else Marabishi. Look At U HH As President,u As Vice And Gbm As Vice, I Can Imagine The Type Of decisions U Will Be Making. Malabishi. Too Bad U Even Oppose God ‘S Work.Wait And See. Well said Dr Banda. Please those of us who think deep about these things need to speak up to expose the evil vices of the most evil PF regime to have ruled Zambia . I totally agree with you doctor that this is pure fraud to mislead the civil servants that they are getting more money when in fact not. This pure electioneering we last saw in the last days of the KK regime. Did it work ? Big No. The writing is on the wall . PF kuyabebele unless they rig the elections. Banda and UUPN tell us how you would have arrested the decline of the Kwacha. Why aar you not talking about the mining houses who refused to pay equitable taxes when copper prices were high? Remember the Windfall taxes debate? Ask HH what he thought of them. Today Zambia would have been swimming in dollars instead of borrowing bond money which have contributed to the Kwacha decline. Lungu has only been in power for eight months. Stop hood winking your self. Banda. You have no brains. How are you brainwashed when actually you don’t have brains? @Malambo-You failed to analyse & assimilate a simple article from Dr Banda which is typical of PF morons!Just on Wednesday, I was telling a host of teachers & nurses that this PF has again managed to manipulate the dull Unionists who were said to have been bargaining for new salary increments!This is an insult & a mockery to these gullible civil servants, as one would expect Lungu to drastically reduce his cabinet,unviable missions abroad/ambassadors,all DCs & deputy ministers & provincial ministers including thousands of cadres on their payroll!Next campaigns will be very interesting as more people & provinces will be booing Lungu & his cronies in PF. Dr. Banda is not a mathematician and he is better staying out of mathematics. The increment does not offset the depreciation of the Kwacha against the dollar (not the country’s medium of exchange though). So, it is an increment from the reference point which is the present value. It falls short of a desirable increase given the new reference point. Comment: Fyonse kutalika. People are getting tired of you. You behave as if you are not learned. Even if it was 100%, you wouldn’t have agreed. That’s the upnd we know, desperate as usual. 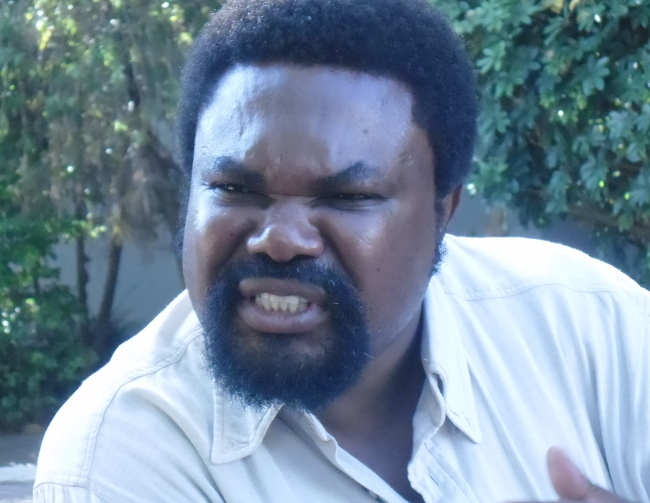 Comment:Ba UPND have nothing better to offer to the Zambian people. Thanks to the PF govt for the increments and haters will always yap. We’ll support the govt in a way that will move our country forward but for UPND, you have no workable solution as you think you can change things without involving Zambians. I pity you……. But why doesnt Edgar Lungu kust step down? Everything he touches is a mess. We need a much more viable & proactive youth wing in UPND not only leaving almost everything to HH,GBM,Garry,Canisious,Nalumango,Maureen,Mucheleka,Ngoma & a few middle aged folks!I’m missing the likes of our once viable & progressive Joe Kalusa from CB!We need more of Kabwe’s Chibwana type & we are there in waiting! GUYS Bola Panshi,opposing Everything Only Means Decampagning Yourselves,best Approach Is Wait People Talk And Analyse Before U Come In To Say Anything & At Times Don’t Comment.Who Knows Workers Could Be Happy. LET US CIVIL SERVANTS TALK IMBWA IMWE. We are suffering and you are busy. Praising a non functional government. Am in Mtendere here were I am, its not things. Its only an ***** who will praise these mother ****ers. Typical of UPND characters. Everything, no matter how laudable, is wrong and must be criticized. Why are you Mr. Banda complaining on behalf of the union? How about when the Kwacha shall appreciate, are you going to then say it is too much an increment? You and your boss are a perfect set of “intellectuals”. You shall continue in the opposition after 2016 elections even when you offload the moneys, we shall chew it and still vote for the RIGHT people who have respect for GOD. Not everyone who says Lord, Lord shall be saved. This means you got to be careful with people who bring in Gods name when things are BAD,because they tend to forget HIM when all seems well. This tribal unpd party pipo are now tired of yo stupid complaining over everything. U want civil servants salaries 2 remain constant?? Is this what William banda yo economic advisor is misleading u.
What’s tribal about Dr Banda’s observation? All we see is tribe..take off those tribal spectacles and being to see things in an objectivity manner. That’s zambia is where it is because of such trivia and pettiness. I like ECL and hold him in very high esteem but I feel those who claim to support him are the ones alienating our dear president.. This tribal stench is nauseating to say the least. Let’s wisen up! The Problem that is killing PF is such members who are trivial by attacking one another with tribal allegation and insults . Lets debate maturely and analyze issues as brothers and sister. Governments come governments go but we still remain Zambians. Who says PF will remain forever, Who say Upnd will also remain forever. You lose nothing by being objective. Upnd cadres complaining all the time. U are saying the government is broke yet u want civil servants to get 100% increament! Cow manure has affected yo reasoning. U have became the spokes persons of all Zambians. M seeing another flight HH 2016 crashing to the ground. KACHEMAS crying foul again next year.Boma ni boma,you will need a revolution to unseat PF not this yapping m seeing.At the moment you DONT just ve the numbers.Continue fantasising yourselves. Dr Banda, you are playing politics other than being an intellectual. The process increments isn’t done in a day, week or month. It is a long process. Kwena nashininkisha ba pf cadres mwalipena. You mean you are just there to oppose everything even factual material like this one? Civil servants have been mocked by these so called increments because their unions are bought by government. This is the most hopeless government Zambia has ever had. Hate him or not 2016 HH all the way. There is no cheating and deception here Canisius; these unionists probably understand numbers better than you do. Even if you perceive these not to be increments but cushions, is it not better to have a cushion than no cushion at all? The fact is that the civil servants have experienced an increment in their salaries and are contented with their achievement – which is why they are not issuing any threats of strike action or on the streets demonstrating. There is no cheating and deception here Canisius; these unionists probably understand numbers better than you do. Even if you perceive these not to be increments but cushions, is it not better to have a cushion than no cushion at all? Can Canisius scientifically or mathematically prove that the civil servants salaries depreciated to -1? How did he arrive at -1 and not -0.50 or -0.75? What is the mathematical basis for his figure of -1? 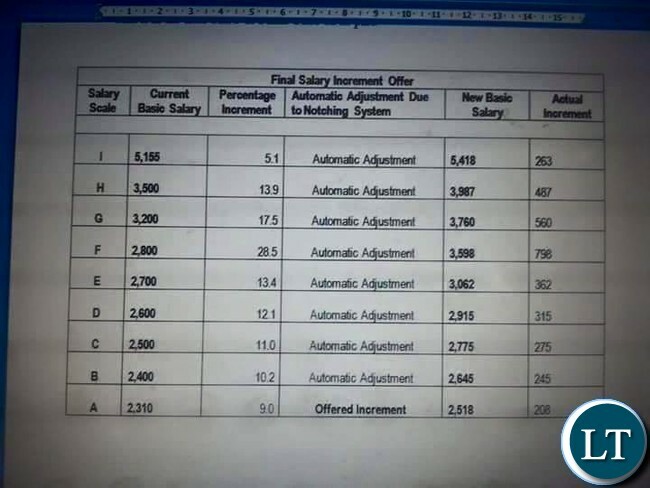 If the civil servants salaries had not been increased, it means that they had remained the same; this means that their salaries had remained at 0. Thus any movement above zero is an improvement. If the civil servants receive 5.1% (+0.51).to 28.5% (+0.285) increase in their salaries, this is an increment from zero. Why is Canisius therefore talking about -0.51 and -0.285 and not +0.51 and +0.285? There is no movement towards the past, Canisius. The fact is that the civil servants have experienced an increment in their salaries and are contented with their achievement – which is why they are not issuing any threats of strike action or on the streets demonstrating. There is no cheating and deception here Canisius; these unionists probably understand numbers better than you do. Even if you perceive these not to be increments but cushions, is it not better to have a cushion than no cushion at all? These tribal party guys write on anything even without thinking.I am a civil servant and my vote will be for Lungu in 2016.He is humble and sincere. Who made Canisius Banda as the spokesperson for civil servants ? Shut up your mouth Sir because we have Unions that ably represent us. Canissius, if your salary increases from K1000 to K1200, it has increaded by 20% not so? That is 20%increment. That is the case Dr C. Banda is making. The failure to a desirable increase given the new reference point (now galloping inflation) distorts the truth of the much talked increament. its reflection amounts to deceiving civil servants that they are better off with the increament given. In essence, they are worse off given the spiral of inflation affecting the food basket of families in the country. That is unrealistic. what is required is to cut government officials wage bill and other unnecessary expenditure to mitigate civil servants low salaries. Wonderful analysis Dr Banda. But don’t just end there. Will you tell the economist, hakainde, to promise Zambia that he will be making automatic salary increments nd reductions overtime the Kwacha falls or falls respectively? You may as well liquidate the Kwacha and go the dollar way. Totally puerile assertions to excite your non-analytical members. The point about a new reference resulting from inflation and the depreciation of the kwacha is understood by most of us. But still, Maikalange has made this point and I quote: “Even if you perceive these not to be increments but cushions, is it not better to have a cushion than no cushion at all?” In other words, should the civil servants have been left at the new reference point without any relief whatsoever? Isn’t half a loaf better than none? This chap us dull, he can’t see that HH has already dumped him for a fellow rich guy GBM. HH is using him to try and get to plot 1. Open your eyes Doc before you become laughing stock.